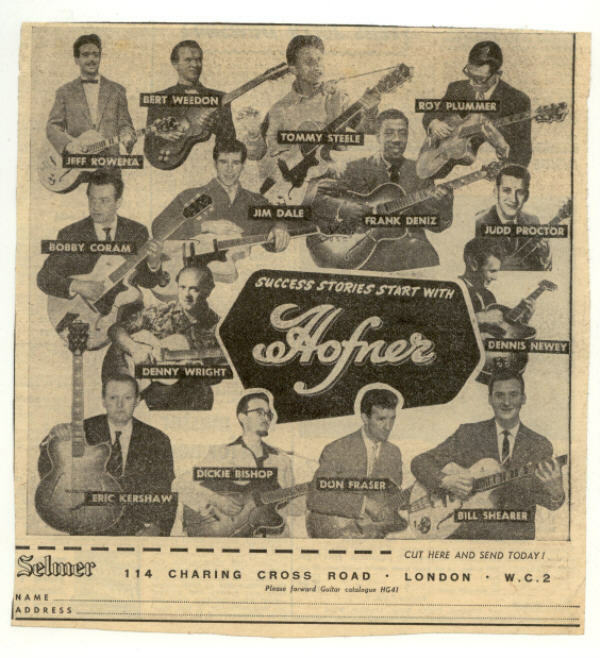 HOFNER, SELMER, AND "THE MELODY MAKER"
Prior to "Beat Instrumental" coming along as a monthly magazine, the two weekly newspapers dealing with all-things musical in the UK during the 1950's and 60's were Melody Maker and The New Musical Express. These two publications provided predominantly up-to-date news on the activities of the recording industry, Tin Pan Alley and the concert promoters, but also many advertisements for musical instrument manufacturers and retailers. 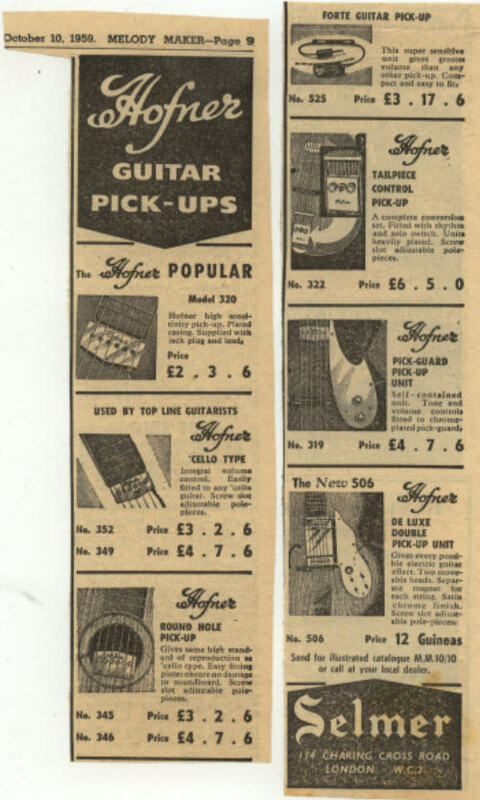 The following are advertisements placed in Melody Maker by Selmer in the mid / late 1950's and early 1960s for Hofner and Futurama guitars and accessories. 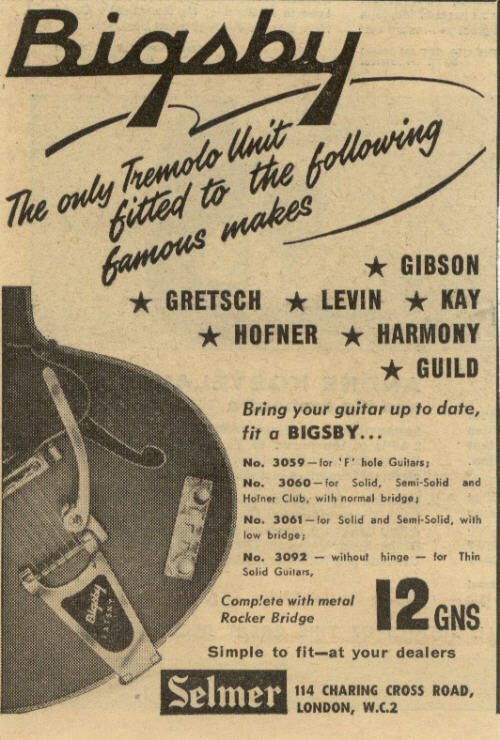 Advert placed by Selmer in October 1959, shortly after the Golden Hofner had been announced. 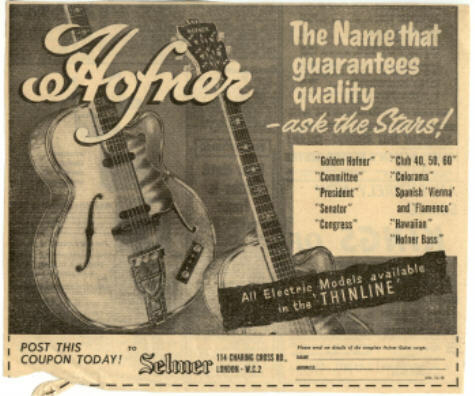 The Hofner range sold by Selmer is listed, and the newly introduced "thinline" archtop bodies is being actively promoted. 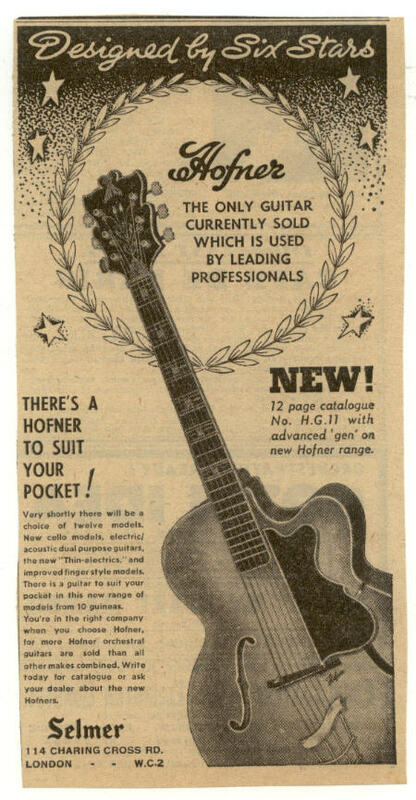 Hofners were used by many of the top UK guitarist of the 1950's, and this advert draws heavily on this fact. The personalities illustrated range from the pop star Tommy Steele to such respected session musicians as Judd Proctor. Bert Weedon was both a session musician and a recording star in his own right. 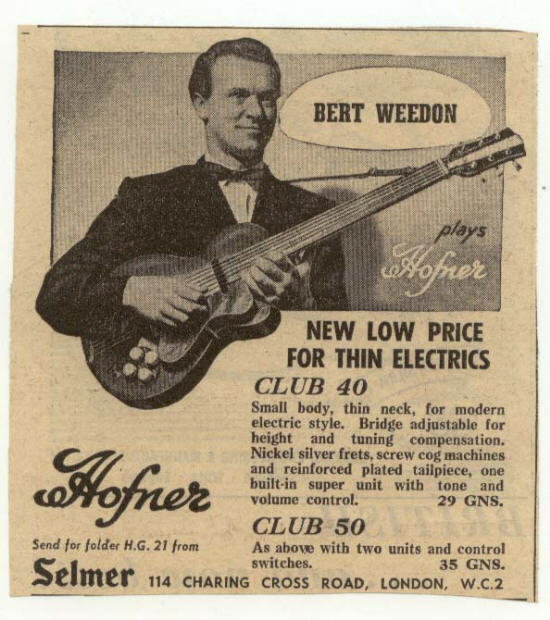 This advert is from around 1957 and shows Bert playing an early Club 50. 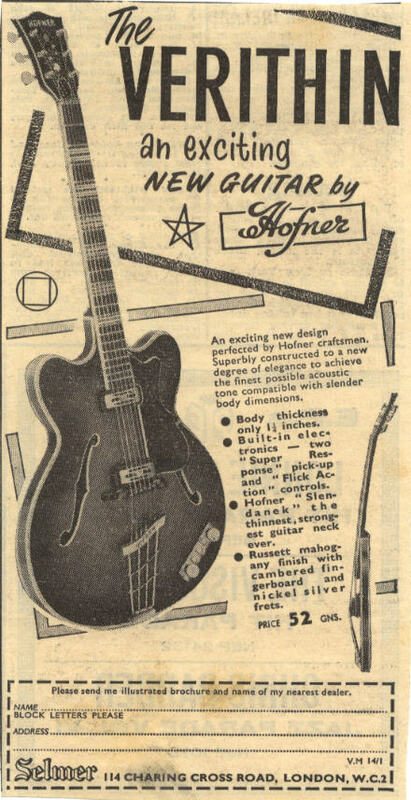 A later advert from 1959, by which time Bert has moved up to what looks like a Golden Hofner, but which could possibly be the earlier Committee Deluxe or maybe a prototype Golden as it does not appear to have a truss rod. 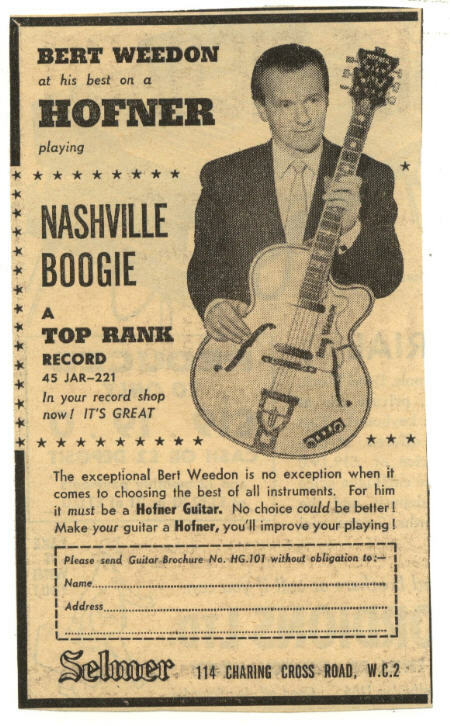 The Bert Weedon record "Nashville Boogie" is promoted on this ad. Bert Weedon, still with his Golden/Deluxe Hofner, but this time bringing Selmer Truvoice amps to the readers attention. The date is around 1958 to 60, and the amp looks to be a Truvoice Professional model. This ad must date from around 1954. 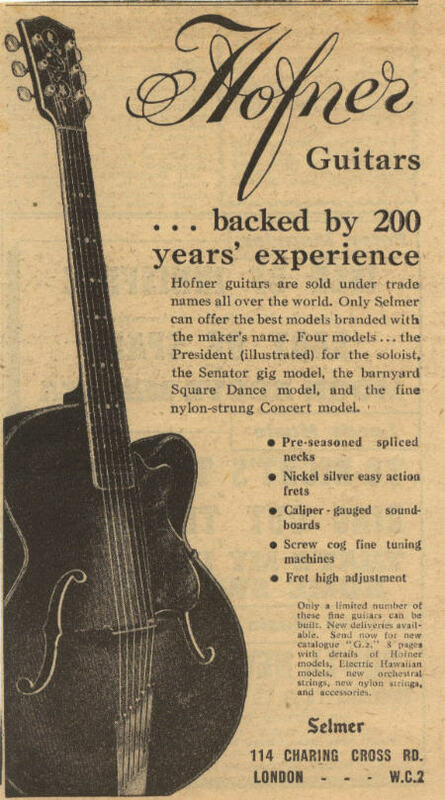 The Square Dance is still in Selmer's Hofner four guitar range, as well as the President, Senator, and a nylon strung "Concert" model. There is no mention yet of the Committee. Look out for the note that states that "only a limited number of these fine guitars can be built". The Committee arrives, but there is no mention of its name at this stage! Only that it is a Hofner which has been designed by "Six Stars". Note the tortoishell pickguard. The emphasis is very much on Hofner being the make that is used by the majority of professional guitarists (in the UK). The c1955 advert also announces that the range is shortly to be increased to 12 models. The Congress is in the range, and the Flamenco model is introduced! The Congress still has the simple trapeze tailpiece, so this must be about 1956. 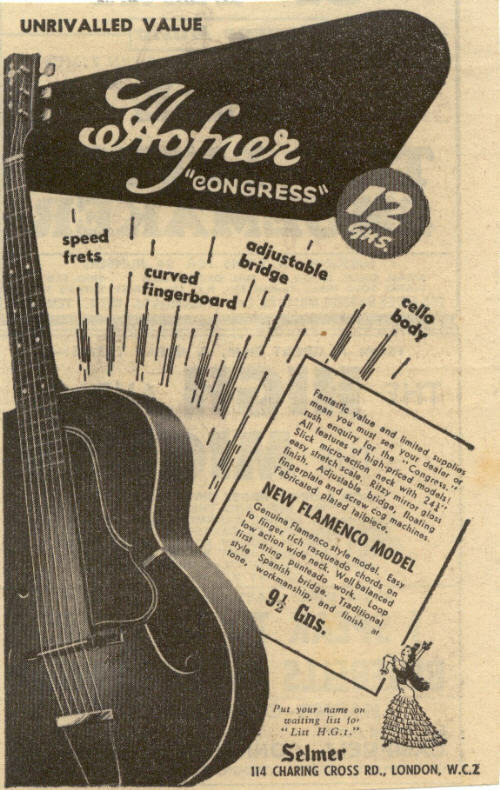 And here is the Hofner Flamenco in this c1956/57 advert. The Hofner logo is located just below the bridge on the early guitars. The "only low-priced" model with trouble-free screw cog machines". An absolute bargain at 9½ guineas! So Selmer are telling us here that the Hofner Senator was the most popular guitar in the UK. Back in the late 1950's, that was almost certainly the truth! The Hofner rectangular control consul is introduced, and with it comes the Club 60 in 1958. The advert warns that Hofners are still in short supply. The 500/5 Hofner Bass Guitar appeared in 1959 or maybe late 1958. This type of instrument was a revelation to austerity Britain, and Selmer probably worked hard with the advertising to get bass guitars accepted by the UK's bass players. Strangely, the price of the brunette 500/5 had been reduced to 41 guineas by 1960. This 1960's advert introduces the Verythin. Note that the finish offered initially is "russett mahogany". By the time that the 1962 catalogue had been issued it had changed to "cherry red". 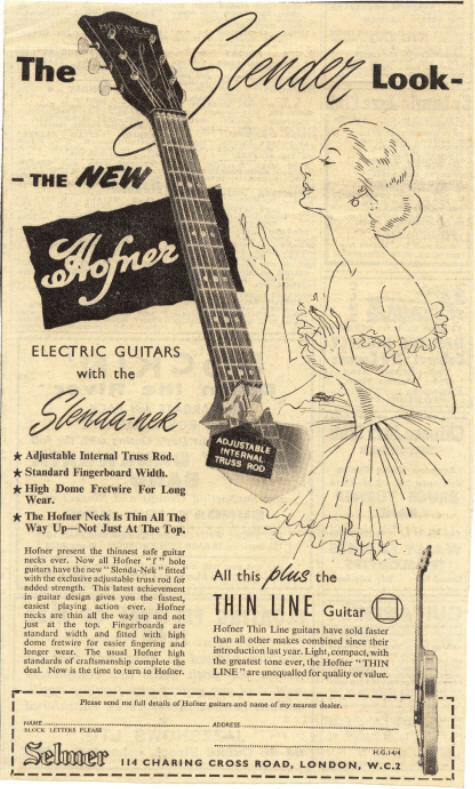 The Hofner "Toaster" pickup was introduced in 1960, from which time this advert dates. The truss-rod reinforced "Slenda-nek" was also introduced at the same time. 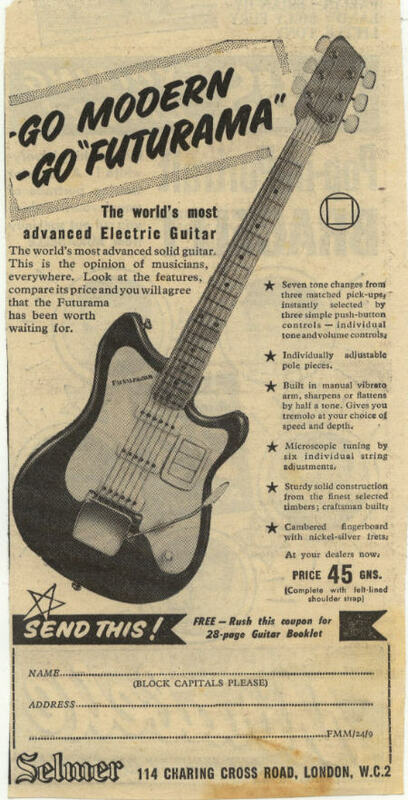 This c1960 advert demonstrates just how much guitar advertising has changed over the years. A society lady in evening dress advertising a guitar neck ??!! Hofner and Selmer were obviously very proud of the new truss-rod equipped "Slenda-nek" to devote a whole advertisement to it. 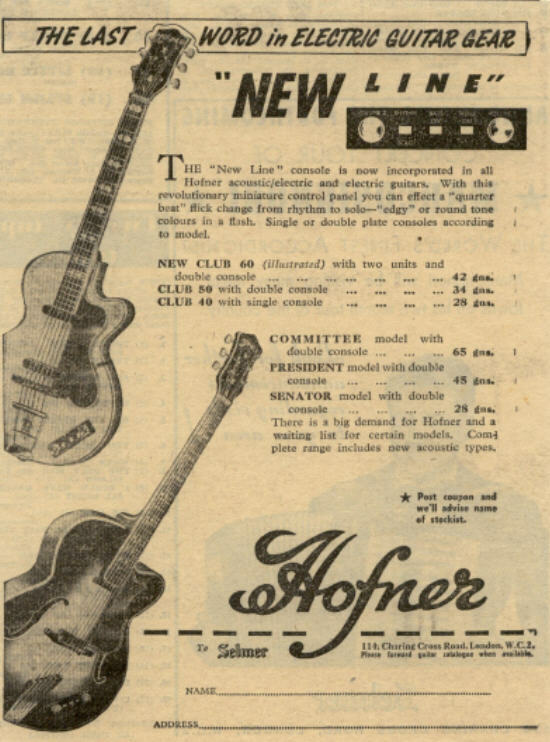 Hofner's range of "add-on" pickups advertised in October 1959. 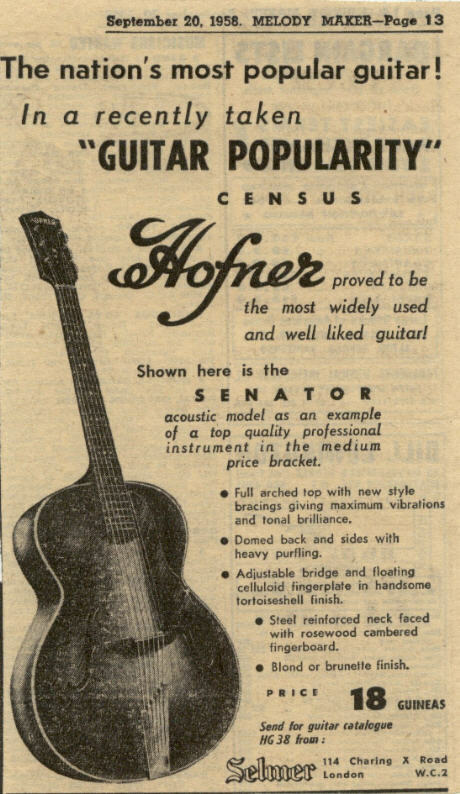 Selmer sold large numbers of this type of unit to owners of acoustic archtops who wished to join the trend towards amplified music, but without going to the expense of a new electric guitar. 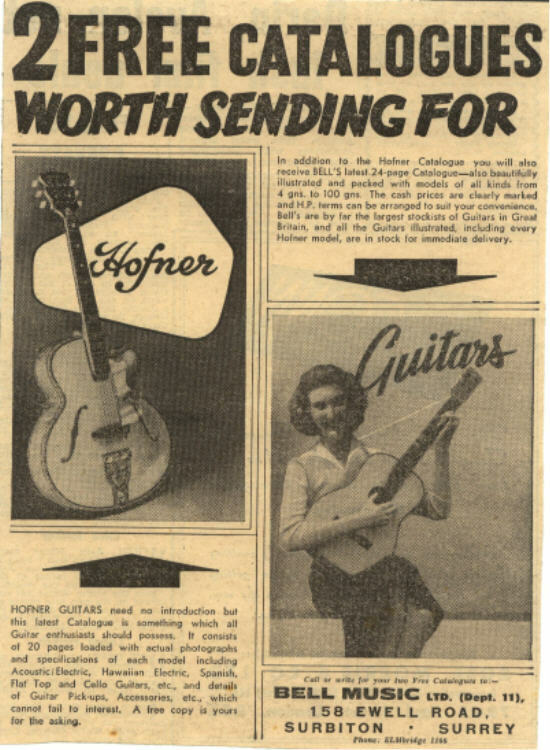 Selmer's other top selling brand was Futurama, which really was a name that Selmer gave to imported Czechoslovakian guitars at the time of this particular advert - c1958. A Grazioso built Futurama III Solid is featured here, and this guitar was one of the foundation stones of British rock music in the late 50's/early 60's. 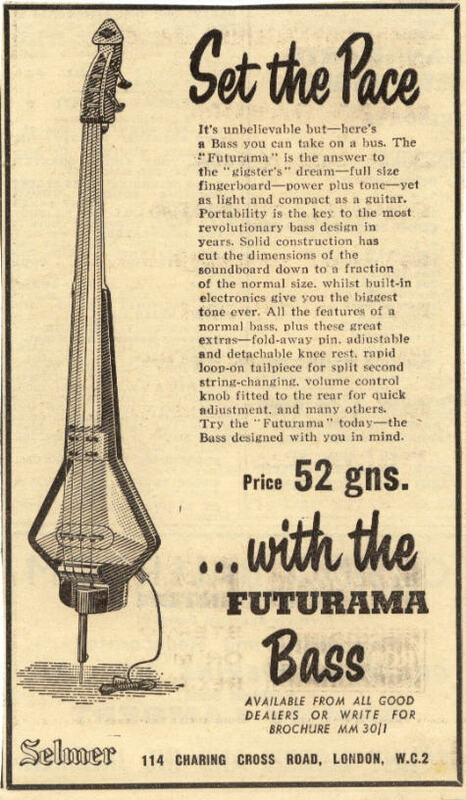 And.......the Futurama "stand-up" electric bass !! The "Bass that you can take on a bus" was sold by Selmer from around 1959 to 61. Selmer entered into a manufacturing licence agreement for the Bigsby vibrato unit sometime around 1961/62. 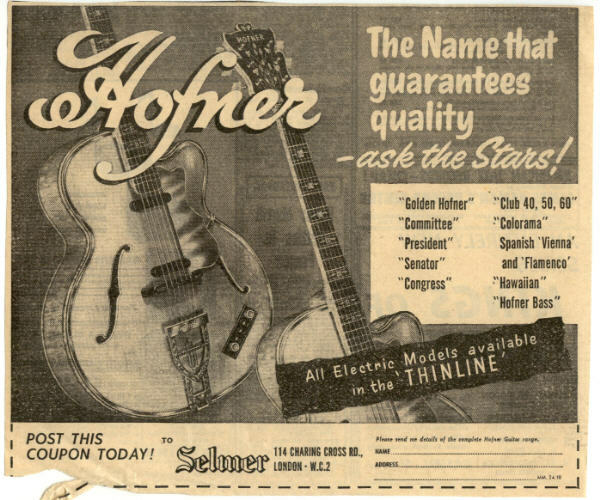 From then onwards, Selmer distributed Hofner archtops and semis were offered with the Bigsby as an extra-cost option. This advert is for the unit as an "add-on". This as actually a Bells Music advert from around 1959/60. Bells were a prolific advertiser in Melody Maker, and their catalogue was a must for every UK guitarist at the time. Usually, the Selmer guitar and amplifier catalogues were also sent out with Bell's own catalogue, as is the case here.